I’ve been off the radar for a few days. Unfortunately I had to move my hosting to another provider as my last provider was hit with a continual DDOS (Dedicated Denial of Service) attack. For the less tech-savvy of you out there, a DDOS attack involves using a network of hijacked (infected) computers to constantly access your servers. Essentially, thousands (if not millions) of computers from around the world try and access your server at once and temporarily puts them offline because they cannot handle the traffic. Unfortunately there is little that can be done to protect yourself against one of these attacks – but thankfully they don’t happen too often. Where to start?! June was a busy, busy month. 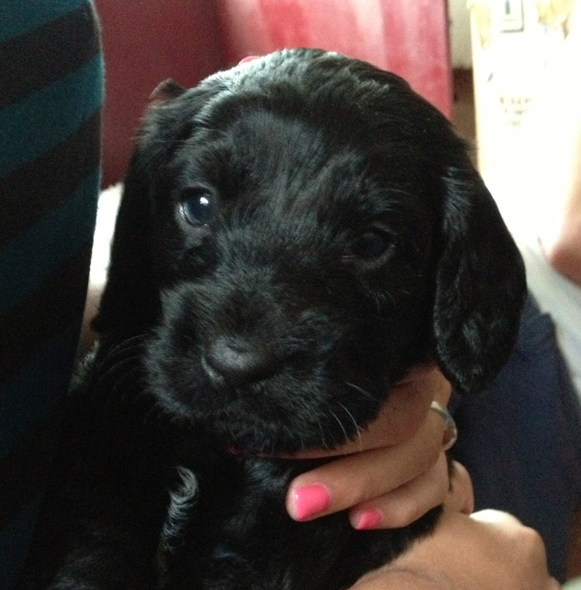 Although the excitement of Mexico turned into the harsh reality of going back to work, I have had a pretty fun month.First and foremost, for those of you who didn’t catch the news – WE ARE GETTING A DOG!! The second highlight of the month was completing TOUGH MUDDER! Most of you have probably heard of Tough Mudder by now – a race over 12 miles of mud and 21 obstacles; from bud baths to electric shock therapy and climbing under tanks to running up quarter pipes… it was an amazing day! The training majorly paid off and I am so glad that I forced myself to run four times a week over the last few months. It made leaving the beach each day in Mexico to run 5 miles in the air-conditioned gym worthwhile – and NO, that is not a joke – I was that dedicated! There is a 2 minutes video that shows our course below.. The next big news item is that I have officially started PLAYING GOLF. After retiring from the game 12 years ago (I have played all of two times in my life) it was time to officially learn. It was my 25th birthday a couple of days ago and I figured that on entering my second quarter-century, it was acceptable to take up an ‘old-man’s-sport’ (just kidding golf-fanatics)! I spent an entire semester at University playing virtual golf in the form of Tiger Woods on the Wii… turns out that a lot of those skills are not transferable! In fact… I think some put me at a distinct disadvantage. That said, I have played a couple of rounds with some friends and am really enjoying it. Mrs Scot bought me an awesome set of clubs for my birthday so I don’t even have to hire a set! Score! I went on the best PRESENTATION SKILLS COURSE ever! I was lucky enough to be nominated to attend a great course at work where I was thrown in the deep end… A day of filming and watching back, adapting then filming and watching back (repeat) in front of a group of people. Nothing helps you realize what you are doing wrong more than watching yourself back! Although it was uncomfortable at first, by the end of the day the value became obvious. I now also star in my very own DVD! I have surprisingly continued the theme of reading this month – Although I have made the transition from Fiction to Non-Fiction! June was a month of comedy. We left the seriousness of Game of Thrones behind to embrace Two and a Half Men and The Big Bang Theory. Not very unique here given that these are two of the most popular comedy shows in the world, but still ridiculously funny! We are officially up-to-date now and eagerly awaiting new seasons to kick-off in September. 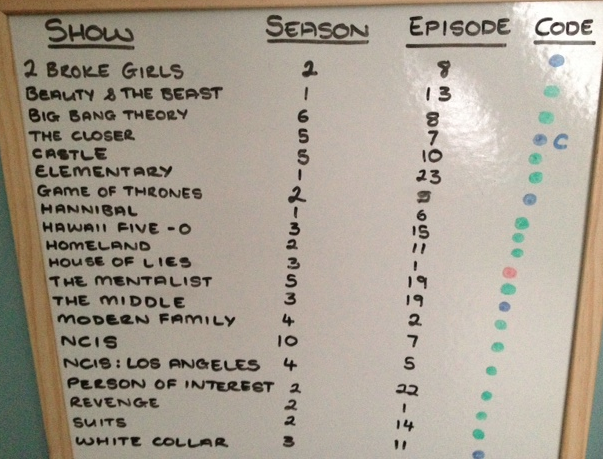 We are also (very) sad and have made an attempt to track some of the main shows that we watch on a whiteboard. Before you laugh, I want to add that it is a HUGE productivity boost… when you watch shows in the chaotic order that we do, it becomes very difficult to remember what episode you were on and you can waste a lot of time! If you are thinking about getting a BBQ anytime soon, I highly recommend going for a Weber. Nothing quite beats the traditional taste of food cooked on charcoal! Congrats on Tough Mudder! I watched the video and it looks amazing! I can only imagine how big satisfaction it must be after completing that! 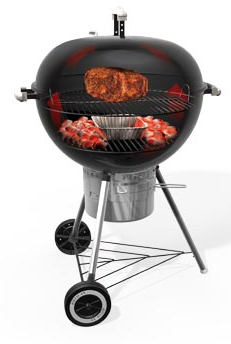 And I agree with Weber bbq-it’s definitely worth buying!